When Paradise PD co-creators Waco O’Guin and Roger Black answer the phone, at first it’s a little difficult to tell them apart. The pair share a distinctive Southern drawl both with each other and the majority of the characters on their 10 half-hour episode Netflix adult animated series. Paradise PD follows the ultra-violent, NSFW, hilarious exploits of an incompetent small-town police department — and it was produced in Toon Boom Storyboard Pro and Toon Boom Harmony animation software by Bento Box Entertainment. 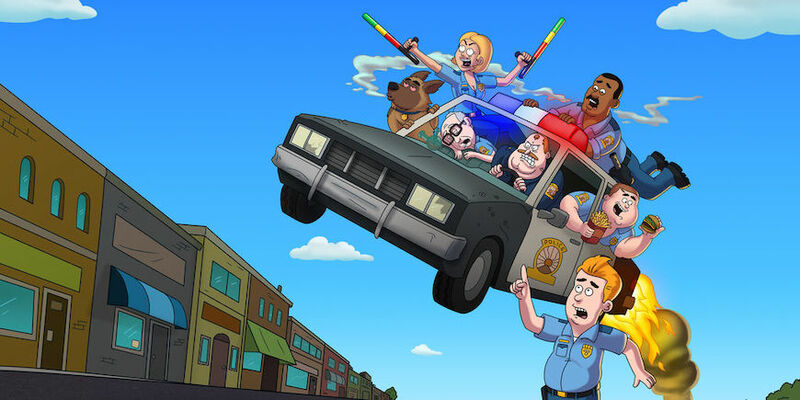 From its cast to character design, Paradise PD has been described as a spiritual successor to O’Guin and Black’s previous collaboration, Comedy Central’s park ranger-centred Brickleberry (also produced in Toon Boom animation software) — with the added creative freedom of being on Netflix. Clearly the cop show has arrested audiences’ attention; the streaming giant renewed the series for a 20-episode second season in October as part of its continued investment in adult animation. Production has begun on more hillbilly hijinks, with O’Guin and Black mentioning they had just wrapped up a first table reading for episode 2.01. 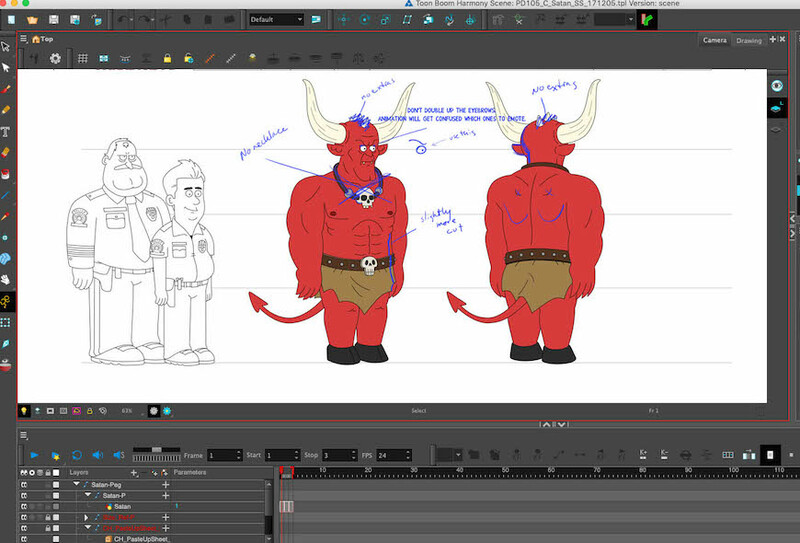 Toon Boom Animation spoke with Waco O’Guin and Roger Black about creating an adult animated series for Netflix, what fans can expect from season two and the benefits of producing Paradise PD in Storyboard Pro and Harmony. Hi guys! How do you feel about people referring to Paradise PD as Brickleberry 2.0? O’Guin: As long as we’re not being called Family Guy 2.0, we feel pretty good about it. Being compared to yourself is a good feeling. Given the similarities, what differentiates Paradise PD from Brickleberry? O’Guin: My wife has two brothers who are cops and I’ve spent a lot of time around them. We love doing workplace comedies, as we did with Brickleberry, and didn’t want to do a straight family comedy. That said, we did want to have a family element in a workplace comedy. Cops felt like the next step for us. It certainly makes for an interesting dynamic. O’Guin: Yeah, it’s like idiots with guns. If we could watch that forever, we’d be happy. We have a lot of fun doing [Paradise PD] and giving people something to laugh at. Paradise PD came at a huge moment in adult animation. Why do you think the genre is suddenly so popular? O’Guin: I think it’s all the new markets. I don’t think people realized how popular it was until the streamers came out. The Simpsons has been around forever, but it was the only game in town for so long. I think it’s a combination of the streamers and the network executives doing something because they know people like it. O’Guin: Yeah, it’s hard to get a live dog to do cocaine on camera. Animation softens everything. It starts off from a more playful, non-serious place that you can push further and be darker than you ever could with live-action. When you’re doing these over-the-top scenes, do you have more creative freedom with Netflix compared to a traditional broadcaster? Black: Yeah, we basically police ourselves. It’s freeing not having constraints and having to worry. As crazy as Brickleberry was, it still had to filter through a S and P [note: Standards and Practices] department at Comedy Central. Netflix doesn’t even have one! Were there any other benefits to working with a streaming platform like Netflix? O’Guin: The thing we liked the best is probably the most boring. Traditional broadcasters have strict rules about time limits. Not only does every episode have to be a certain amount of time, down to the frame, but each act has to fall within a strict range too. We used to spend so much time trying to cut a few seconds here and there to fit into those frames, which was a huge pain. Netflix has none of those rules. You don’t even need acts if you don’t want them since there are no commercials. We still keep the act structure for storytelling, but there are no restraints. It frees up so much more time for us to focus on making the show better. Speaking of making the show, how involved were you in Paradise PD’s animation? O’Guin: Very. We have in-house animators so when the work comes back from overseas, we go over it with them to help them understand our vision. I was an animation major and Roger was an art major in college. One of our favourite parts of the process is getting to be involved in the animation. Are you involved from character design and storyboarding all the way through to animation? Black: Yeah, we are. We’ll go to storyboard reviews to get what we want there then we give our notes to the animators before animation. Do you ever work directly in Toon Boom Storyboard Pro or Harmony? O’Guin: I dabbled in Toon Boom Harmony on Brickleberry and, if we had the time, I’d probably use it more. We love the programs and all our directors and animators use the animation software; it works so well. 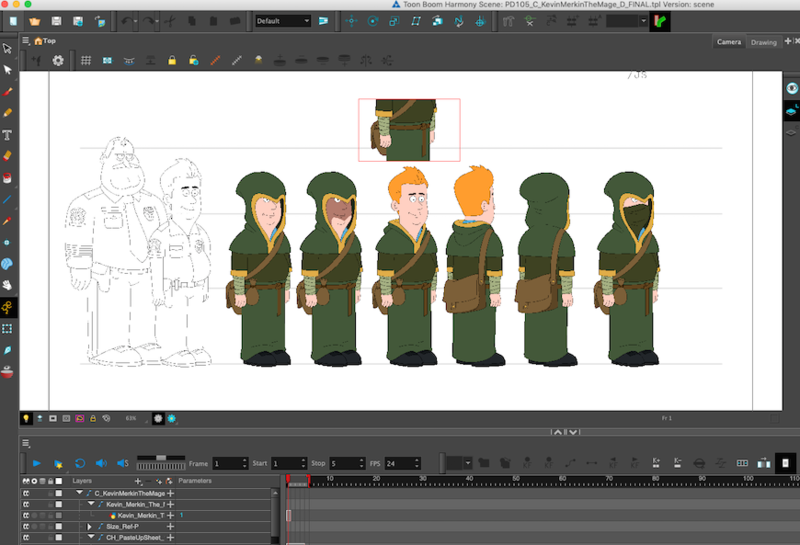 What kind of features and tools do you like in Toon Boom animation software? O’Guin: Just being a vector-based program where you can zoom all the way in. We’re actually trying to get all our backgrounds and characters drawn in Toon Boom Harmony so we’re not using Photoshop anymore. That way we’ll be able to pop into a background and not worry about it getting pixelated or having to redraw. On season one of Paradise PD, we did all the characters in Harmony and they looked fantastic. We’re trying to move backgrounds now too so that every file is a vector and doesn’t have to be redrawn. That’s what we’re really excited about for season two. Harmony’s so functional and it can do any kind of animation you want it to. Joel Kuwahara at Bento Box is always talking about how great Toon Boom Harmony is and is trying to get all our overseas studios switched over to it, too. How many animators do you have working on the series, including overseas? Black: In-house, we have seven to 10. Overseas, there could be hundreds. Sometimes, we use three studios to get the animation done. I would say at least 100. Do you know how long production on season one was? Black: It was a year in total, including about eight weeks of writing. By the time we delivered all 10 episodes, it was almost exactly a year. We have 20 episodes for season two so there will be about 10 episodes in the first year and the rest will come a year later! We’re gonna be working on this for a while. Can you give a sneak peek for season two? O’Guin: We’ll be continuing from the season one finale’s cliffhanger. We don’t want to get into trouble with Netflix over what we can and can’t say! Feeling inspired by Paradise PD? 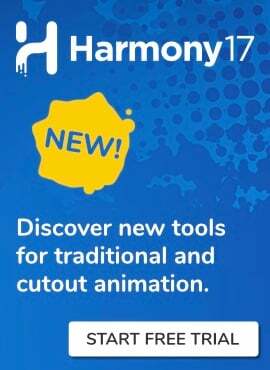 Start your own comedic cartoon today with a free 21-day trial of Toon Boom Harmony animation software.